I'm posting this little update here, since nobody checks this blog at all and I kind of want to keep this a surprise. 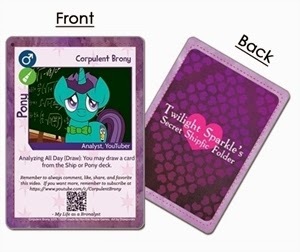 I just ordered a printing of a Corpulent Brony card for the Twilight Sparkle Secret Shipfic Folder game from Horrible People, an awesome card game that's been hugely popular at brony conventions. I'm planning to pass them out in lieu of a business card because they're much more fun and can even be played in the game! What do you think? 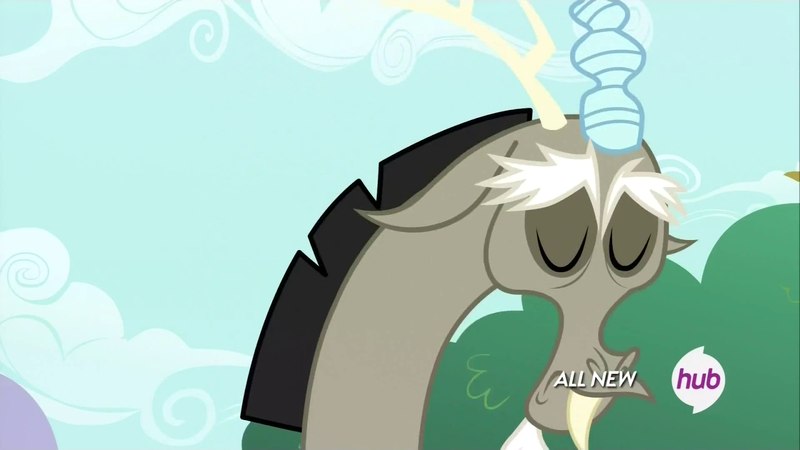 So far I'm planning on attending BronyCon and Grand Brony Gala. I submitted applications to be a community guest at TrotCon and Everfree Northwest. If you'd like to help me become a community guest at either of those, please contact them and let them know! In any event, if our paths cross at any of these conventions feel free to say hello and ask for a card! Well I've been quite busy lately. I've been able to put some time into the Discord analysis video, but it is nowhere near being complete. I'm about 60% done with the silly introduction; the rigors of work, school, and normal life are getting in the way of me being able to devote an adequate amount of time to the endeavor, so I fear the deadline I set for myself of the end of the month is no longer obtainable. This will be the first time in a while, possibly ever, that I've gone a full month without releasing an analysis video, though perhaps I can find some consolation in the fact February is the shortest month. There have been several moments in recent podcasts that have merited a silly new video from me, resulting in the inadvertent creation of a series of sort called "Tears of a X" (where X so far has been weeaboo, twifig, and animator). I link a few of these videos below, the third one of which is as of yet unreleased. I try not to feel too guilty making these videos, they literally take minutes to produce and provide a much needed distraction from editing the other project. I hope some of you find them a little funny. 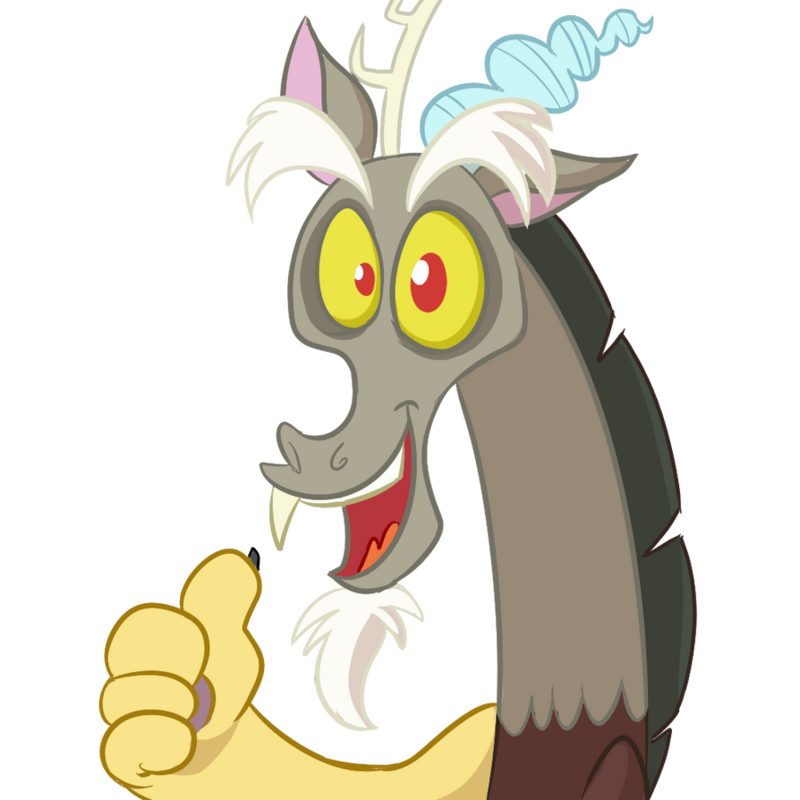 For about the past month, I've deviated away from listening solely to pony music and have returned to what for me is a more normal mix. Regardless, I find myself constantly wanting to make PMVs for various songs. 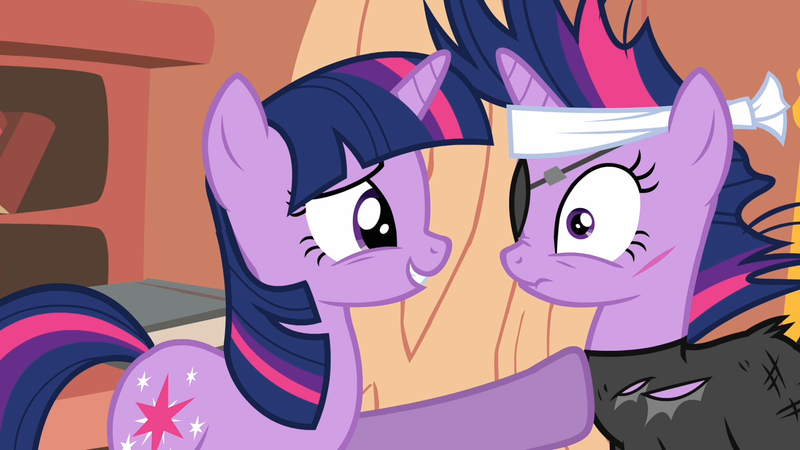 Right now I really want to do a particular PMV, but time devoted to it would inevitably detract from the Discord project. I guess I'll play it by ear and see how things go. UPDATE 2/25/2014 - Another Sneak Peak! Hey so I'm releasing that video I listed above officially today, the Tears of an Animator. In order to keep this little blog post relevant, and since I am linking it in the description of that video, I've decided to go ahead and show you guys what the intro to the Discord video is shaping up to look like. Keep in mind there are still many details to complete, so please don't judge this work in progress too harshly. I make videos on the YouTube about ponies. I specialize in analysis videos, but since these take so much time to put together I often release silly little things in the interim. Additionally, I co-host a number of podcasts, including Pony Tonite Podcast, Limbo Podcast, and, after the hiatus finally ends, Equestria Confidential. Thanks for asking! I've been hard at work on an analysis video taking a closer look at Discord, sort of as a response to other videos I've seen on the same topic. I've been bogged down with the introduction, strep throat, and school lately, but I still am hoping to get this out before the month ends, though it may be difficult. Also, the Legends of Equestria bonus open server weekend the next couple days could take some time away from this project! If you are interested, keep reading, at the bottom I'll throw in a bit of a sneak peak of the intro for this video. After releasing the Discord video, I plan on doing a quick video covering my predictions for Season 5. I think they'll be very different from most others you've seen so far. I then might try to do an episode or two from an earlier point in time to try and come up with some methods I can employ once Season 5 does begin to allow me to create and release episode analyses in a more timely manner. Well, thanks for reading so far and here's the teaser I promised. Obviously the audio is going to be completely changed (it's actually already been recorded), and there will be more stuff added in eventually. Enjoy!